Objectives—We assessed 2 pathways through which dietary antioxidants may counter adverse effects of exposure to particulate matter less than 2.5 micrometers in diameter (PM2.5) on blood pressure (BP): main (compensatory) and modifying (protective) models. Methods—We used 2002 to 2003 data from the Detroit Healthy Environments Partnership community survey conducted with a multiethnic sample of adults (n = 347) in low- to moderate-income, predominantly Hispanic and non-Hispanic Black neighborhoods in Detroit, Michigan. We used generalized estimating equations to test the effects of ambient exposure to PM2.5 and dietary antioxidant intake on BP, with adjustment for multiple confounders. Results—Dietary antioxidant intake was inversely associated with systolic BP (b = −0.5; P < .05)and pulse pressure (b = −0.6; P < .05) in neighborhoods closest to major sources of airpollutants. 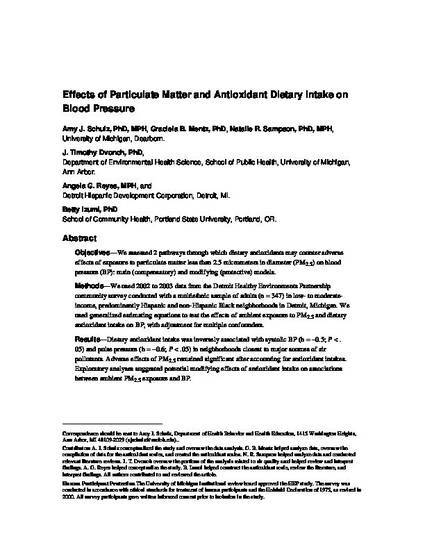 Adverse effects of PM2.5 remained significant after accounting for antioxidant intakes. Exploratory analyses suggested potential modifying effects of antioxidant intake on associations between ambient PM2.5 exposure and BP. This is the author's version of an article which was subsequently published in the American Journal of Public Health, 105(6), 1254-1261.